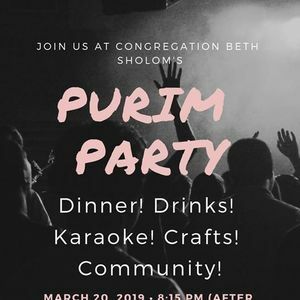 Come celebrate Purim at CBS! Matanot L'evyonim: Rabbi Dolinger will be distributing money locally on Purim Day. People are encouraged to make donations to the Discretionary Fund by giving Rabbi Dolinger a check made out to "Rabbi's Discretionary Fund" no later than Shacharit on Purim Day. Mishloach Manot: the minimum requirement is two food items to one friend (beverages count!). Though people behave otherwise, it's much more preferable to maximize Matanot L'evyonim, gifts for those in need, to Mishloach Manot. Human nature is to want to give more to friends, but Jewish law asks us to consider a different priority. 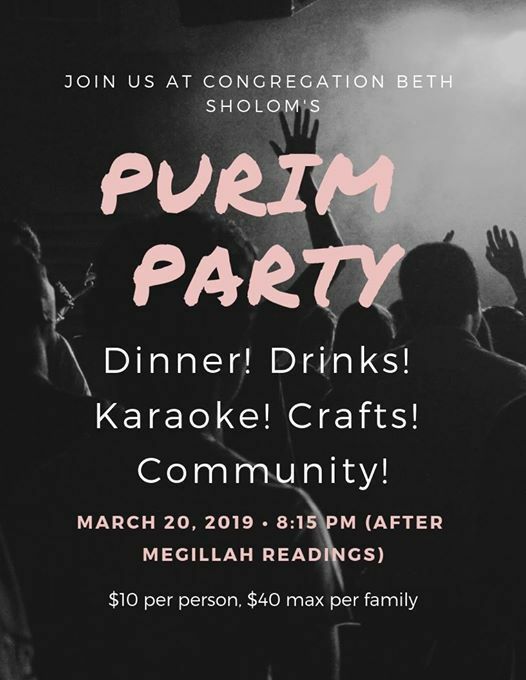 Purim Party - At approximately 8:15 pm, join us for a festive party featuring dinner and drinks, Karaoke, and crafts for older kids. Suggested donation of $10 per person, $40 max per family. Make sure to send all checks for Matanot L'evyonim to Rabbi Dolinger by the time that Shacharit is over - Thanks!